This warm, funny picture book combines a seder celebration with one extended family's special tradition. 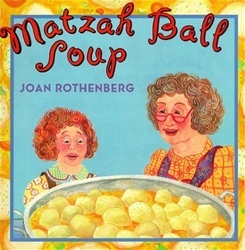 Grandma explains to Rosie why they each have to have four matzah balls in their chicken soup. Her story goes back to when Grandma's Tanta Tee came as a new immigrant from Hungary to join her three sisters in America. Each sister had her own way of making matzah balls, and, after quarreling and kvetching, they had a contest to see whose were the best. 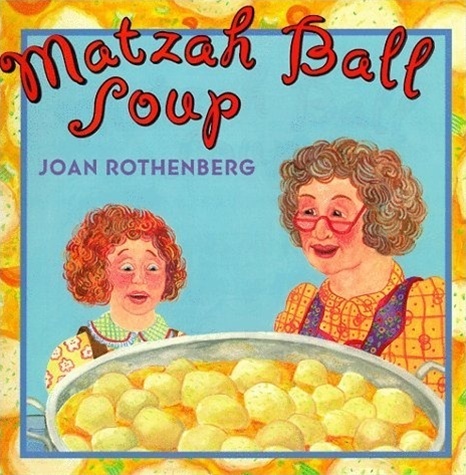 That long-ago holiday celebration, Tanta Tee's first seder in America, connects with the family seder that Rosie and her grandma are attending now, as they go through the four questions, read from the Haggadah, and enjoy the meal. Children will appreciate the comic pictures of the affectionate family dynamics. Of course, there's a recipe at the back--with a variation from each of the four aunts.